About the author/series: Barnaby Ross is a pseudonym of Ellery Queen. 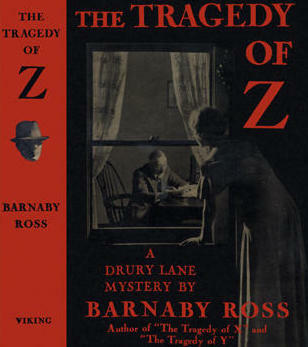 This is the third of four books in the Drury Lane series, the remaining three being The Tragedy of X, The Tragedy of Y, and Drury Lane's Last Case. Elihu Clay is suspicious of his silent partner, Dr. Ira Fawcett; believing he is behind possible corruption in getting state contracts for materials from his quarry. Clay hires private investigator Thumm to look into it. Thumm and his daughter, Patience (our narrator) travel to the Clay mansion in Leeds, NY. Soon after their arrival, Senator Joel Fawcett is found stabbed to death in his library. He had been receiving threats from prisoner Aaron Dow, who had been released earlier that same day. Dow is arrested for the crime. Drury Lane is consulted and proclaims him innocent. Despite this, Dow is convicted on circumstantial evidence and sentenced to life imprisonment. Dow is placed on an outside work detail, and escapes. While on the run, Dr. Ira Fawcett is murdered. Dow is captured. Again, Drury Lane proclaims him innocent. He is sentenced to death. It is refreshing to have a woman narrator appear - Patience Thumm. Her point of view adds a new element to the series. Drury Lane does not even appear until about halfway through the book. Lane assures us the obvious suspect is innocent, so we know right away who is not the murderer. Lane discovers the obscure motive, much like in The Tragedy of X. Another good Barnaby Ross read. It would have been good for the series to have more titles. In the Author's Note, it is poignant to read the teaser "In the intervening period [between Tragedy of Y and Tragedy of Z] Drury Lane solved many strange and perplexing cases, the more interesting of which will be recorded at some future time." It is sad that prediction did not come to pass, and we must be content with only four titles in the series.